National Public Lands Day 2012, a photo by The Bacher Family on Flickr. National Public Lands Day 2012: crews of trail maintenance and restoration volunteers converge on the meadows and trails above Sunrise in Mount Rainier National Park. 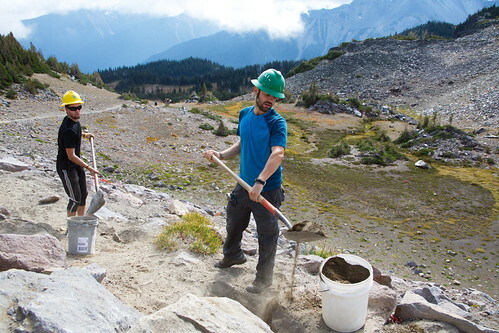 Here's a couple of volunteers working on the Wonderland Trail below Frozen Lake, wearing the helmets of two of the park's most significant partners, the Student Conservation Association and the Washington Trails Association. An hour before I arrived (unfortunately) a black bear wandered by in the little valley just twenty yards beyond the trail.